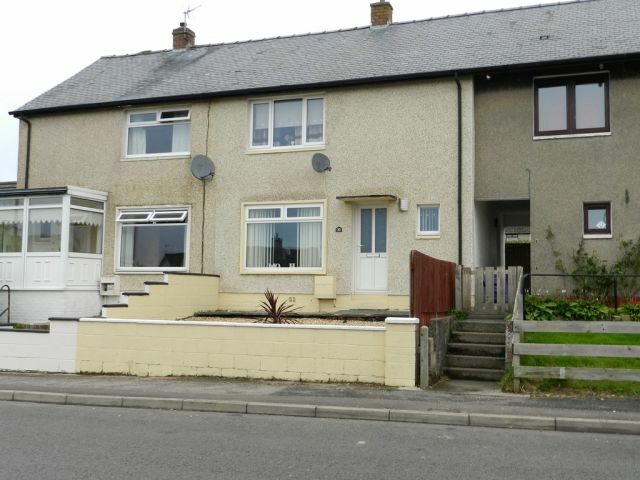 Located in a popular residential area of Annan, within easy distance of Newington Primary School and the town centre. Providing lounge with French doors to rear, kitchen with utility area, two bedrooms – one with storage – and bathroom. Low maintenance garden to front. Patio area to rear and shared access to shared garden. Thinking about moving? We can arrange a free, realistic valuation of your current property. Give us a call on 01461 205690 & we can arrange this for you. Window to front. Smoke alarm. Carpeted flooring. Window to front with curtain pole and blinds. Ceiling light, telephone point, TV point. Gas living flame fire. Radiator, laminated flooring. French doors with blinds leading to rear garden. Window to rear with blinds. One x four spotlights, wall and base units, connection for gas cooker, cooker hood extractor fan. Stainless steel sink and drainer with mixer tap, tiled splashback. Plumbing for washing machine and vented for drier. Space for fridge freezer. Door to side alley access to rear. Loft access. Ceiling light, smoke alarm, storage cupboard. Carpeted flooring. Window to front with curtain pole and blinds. Ceiling light, TV point, storage cupboard. Carpeted flooring. Window to rear with curtain pole. Ceiling light, telephone point, TV point. Radiator, carpeted flooring. Window to rear. Ceiling light, three piece suite comprising toilet, wash hand basin and bath with over head electric shower. Fully boarded and tiled. Heated towel rail, tiled flooring. Low maintenance garden to front and shared access to rear. Patio area to rear and shared rear garden. Offers in the region of £74,000 are invited and should be submitted to lj Residential, 93 High Street, Annan, DG12 6DJ or by fax to: 01461 205037.